Faridabad, the largest city of Haryana, is one of the most favored destinations among the home seekers. Also, the proximity to the city to Delhi, Gurgaon and Greater Noida, and affordable rentals make Faridabad a favorite residential destination among the working professionals. 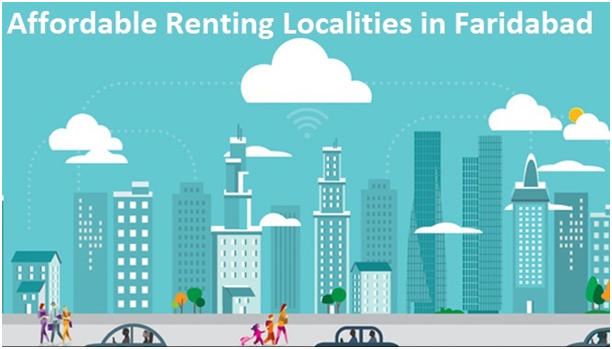 If you are all set to move and reside in Faridabad, here are top five affordable localities where you can look for a rental apartment for yourself. New Industrial Town or NIT is located close to Delhi, Gurgaon, and Old Faridabad, and thus, it is a preferred choice of those who have a daily up and down schedule to these places. Also, NIT is very close to Ballabgarh Railway Station. The commutation facilities from this vicinity to other Delhi NCR regions is truly impressive. Above all, those looking for an affordable rental flat in Faridabad, the NIT locality meets their demand perfectly. Green Valley is another area of Faridabad that offers budget-friendly apartments for rent. Its excellent connectivity to South Delhi makes it the first choice of those with a job, business or educational institution in that area. This upmarket area is packed with all the essential facilities, with the Crown Mall and Big Bazaar being the popular landmarks of the vicinity. Labeling the Sector 27 of Faridabad as the child-friendly locality won’t be untrue. The vicinity has prominent schools, day care centers, gardens, amusement parks, etc. So, if you have children at your place and an affordable flat on rent in Faridabad is what you are looking for, Sector 27 is a haven for you. This locality is evolving as a great dwelling option. Apart from basic infrastructure, the area is also popular for the National Museum and Tughlaqabad Fort Complex. Many consider staying at this locality because of affordable rental and its proximity to NIT locality, Ballabgarh Railway Station and Old Faridabad. Primarily the industrial belt of Faridabad, Surajkund is now emerging to be a hot residential option. This is because of the various factors such as reasonable rent of the residences, strategic location, connectivity with Delhi and Gurgaon via Gurgaon-Faridabad and Mehrauli - Badarpur Road. Many believe that this one locality is growing at a rate faster than that of any other region. The ongoing work of Kundli-Manesar-Palwal Expressway, which will connect Nehrapur with Gurgaon and Delhi directly, is attracting a large number of residential builders to the locality. Also, many residential apartments are on the verge of completion in various sectors falling under Nehrapur such as sector 81, 82, 85, 75, 76. Conclusive Remark: It seems like Faridabad will soon emerge as the next Noida or Gurgaon. With a lot of lucrative and affordable rental apartments, Faridabad is improving its overall look for the home seekers. Above all, online rental portals such as Nestaway.com are making the search for affordable housing option in the city and other regions quite hassle free and easy for the tenants.